OPGW STRINGING EQUIPMENT is specially used for exchange old earth wire with new OPGW line. Our puller tensioner with hydraulic tensioner is one set for exchange work. The hydraulic puller tensioner has big wheel and strong engine for retrieve the hard earth wire well. 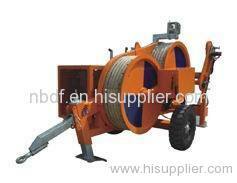 It also can drive hydraulic reel stand for retriving the old earth wire on steel or wooden drum. We also have mobile traction machine, recover roller machine, OPGW running board, OPGW rollers etc. for live line working on transmission line. Application: The universal unit can serve as a tensioner or a puller as desired, for stringing various conductors or earth wires. It is ideal for retrieving operation, by using the old conductor or earth wire as the pulling rope. It is capable of stringing 1 or 2 conductors (as tensioner) simultaneously. -With closed hydraulic circuit and variable displacement plunger pump, the pull/ tension force could be step less controlled. -With the radiator imported from Germany, the machine has good heat dissipate performance. -With a negative spring applied brake, and automatic overload protection. -With rigid axle for towing at high speed, the machine looks beautiful. -With hydraulic power take off to power a take-up reel stand or steel rope take-up carriage. -Heavy duty R-tires with excellent shock-absorbing performance. Application: Used to string single conductor, earth wire, OPGW and ADSS optic fiber cable. -Closed hydraulic circuit, infinitely variable tension control. -The max. tension/pull back force for conductor stringing operation can be preset, and the tension force in the line can be read on the tension gauge. -Spring applied hydraulic released brake acts automatically in case of hydraulic failure to ensure safety. -Hydraulic oil cooling system. Bull wheels lined with wear proof MC nylon. -Mounted on trailer with rigid axle for towing at max. speed of 15km/h on site. -Diesel Engine: Chinese famous branded water-cooled diesel engine. 3. 25 years of production experience and more than 1000 customers in the country and abroad market. The set of 4 ton puller and 3 ton tensioner have been sold to more than 20 countries.